The Conjuring universe has expanded in numerous intriguing ways since the Perron family were first terrorised by the malevolent witch Bathsheba. 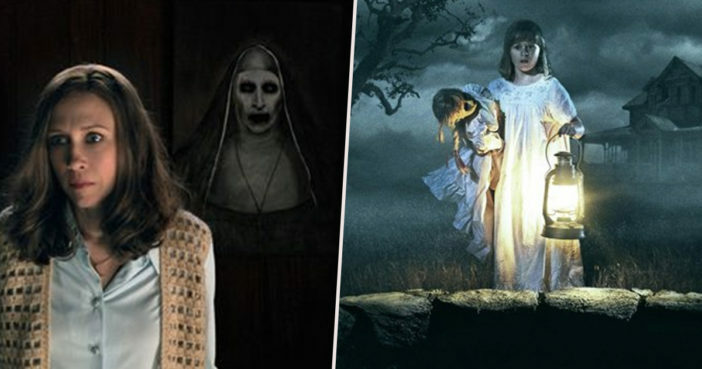 Various spin-offs have led us down dark and twisted paths; from possessed dolls to demonic nuns. Furthermore, the prolific franchise has not dipped in quality; with an eerie buzz still surrounding each new release. However, it’s the main thread of the series – The Conjuring movies themselves – which is undoubtedly the black, beating heart of this spooky world. The spinoffs focus on the origins of some of the ghoulish entities explored by real-life paranormal investigators Ed and Lorraine Warren. The main movies delve into instances where the Warrens attempted to help those thought to be possessed by demonic entities. And we now have a spine-tingling glimpse into what horrors the next instalment – this time directed by Michael Chaves (The Curse of La Llorona) – could hold. All the Conjuring films are based on the case files, so they’re more based on the true story aspect of the real life Warrens. I think that’s important. It’s important that the mothership stays true to the inspiration of the real people. The spinoffs are where we get to have more fun and do weird and wonderful crazy things. The mothership of it being the Conjuring films, we want it to come back to the real stuff. It’s this guy who was on trial for committing a murder, I think it’s the first time in America’s history where the defendant used possessions as a reason, as an excuse. It can be safely assumed this movie will explore the sinister case of Arne Cheyenne Johnson; a tree surgeon from Connecticut who attempted a murder trial defence of ‘guilty by reason of demonic possession’, as reported by The New York Times. On the evening of Friday 16, 1981, Johnson – who was just 19 years old at the time – stabbed kennel manager Alan Bono, 40, over 20 times with a pocketknife. Bono died in hospital a few hours later. This tragic crime was regarded as even more chilling on account of the mysterious events which preceded it. In May 1980, almost one year before committing the murder, Johnson moved into the family home of his girlfriend, Debbie Glatzel. Just one month after Johnson moved in, Debbie’s 11-year-old brother David Glatzel began to have visions of a horrifying ‘beast man’ who wanted to take his soul. The Glatzel family consulted the Warrens, who reportedly believed the boy to be possessed. Three exorcisms were performed in a bid to free David from his demons. He would actually say, ‘Come into me – leave the little lad alone’. The judge did not accept the unusual plea and Johnson was found guilty of first-degree manslaughter. He was handed a 10 to 20 year sentence of which he served five years. The Curse of La Llorona will be in cinemas from April 19, 2019 onwards.